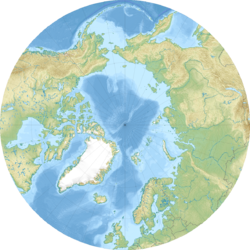 Prince Gustav Adolf Sea is a marginal sea of the Arctic Ocean located in Qikiqtaaluk Region, Nunavut, Canada. It is situated among the islands of the Canadian Arctic Archipelago. The sea is bounded on the west by Borden Island and Mackenzie King Island, and on the east by Ellef Ringnes Island. To the south is Lougheed Island. The sea opens into the Arctic Ocean to the north, and into the Byam Martin Channel and Maclean Strait to the south. The Sea was named in 1898 by Otto Sverdrup after the Swedish prince (and later king) Gustav VI Adolf. ^ Otto Neumann, Sverdrup (1959). Arctic adventures: Adapted from New land: four years in the Arctic regions. Longmans. p. 215. ^ Barr, Elinor (2015-07-27). Swedes in Canada: Invisible Immigrants. University of Toronto Press. ISBN 9781442695153.